Q: Why do Interlocking Concrete Pavers make the ideal pavement? A: Pavers are the ideal product for freeze/thaw environments. Proper installation of the product results in a pavement that is rigid yet flexible. The joints between pavers allow pavement movement without cracking. In addition, they can be removed and replaced to allow for repairs or access to utilities. Pavers are virtually maintenance-free and do not need to be regularly sealed or replaced. Q: Why are they called interlocking concrete pavers? A: Concrete paving stones are engineered so that when installed properly a locking effect is created that keeps each paver from moving independently of its neighbors. There are different degrees of interlock that can be obtained based on the application and paver installation pattern selected. When installed properly, the combination of the pavers, bedding sand, edge restraint and joint sand causes them to interlock, allowing them to work as a unified, flexible pavement. It is the locking of the pavers that causes loads to be spread over a wider area of pavers than where the load was applied. It's the key to the strength of the pavement system. Q: Can pavers be used for a driveway? A: Yes. 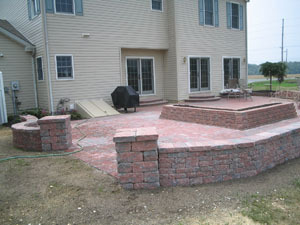 Pavers can be used for vehicular applications such as driveways. Depending on the application the installation and choice of materials will vary. Q: Can Pavers be used for a pool deck? A: Yes. Not only do Pavers make an attractive pool deck, but they also provide a slip resistant surface to walk on. Pavers actually are better than poured concrete around pools from the standpoint that the joints will take on moisture and leave the pavement cooler under foot. Like all products that are used outdoors, lighter colors will tend to stay cooler as they reflect the sunlight. Also, if you ever have to service the area below the pavers you can easily lift and re-lay the pavers. 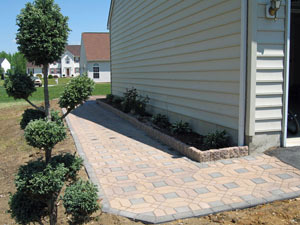 Q: How soon after installation can I use my paver walk, driveway or patio? A: Generally, a finished paver project can be used the following day if a polymer based joint fill is used. If basic sand is used to fill paver joints, then the project can be used immediately. Q: How do pavers compare with patterned or stamped concrete? A: Patterned concrete pavements are merely slabs of concrete that are embossed with a pattern. Therefore, they are prone to the same problems with freeze/thaw cycles, namely cracking and spalling. Stamped concrete requires expansion joints every 10 feet or so which are very distracting in some patterns. Patterned concrete pavements do not allow access to underground utilities or the ability to make repairs. Q: What process do you perform when installing a paving system? A: The process used meets all standards set by EP Henry, NCMA, ICPI and All Seasons Landscaping. Q: Is the paver base material set directly on the subgrade? A: No. A separation fabric or “geotextile” is used under all paver and garden/retaining wall installations. The fabric is laid on top of the compacted soil in the excavated area and along the sides of excavated areas. It is made of plastic threads that allow water to pass around them, but not very small particles of soil beneath them. Geotextile separates and contains the base from the underlying soil subgrade. It allows the base to shed water, and prevents the soil around it from working its way into the base. Without geotextile, the soil will work its way into the base and weaken it. This is a slow process that happens when the soil is saturated with water or during periods of thawing. Geotextile stops this process and extends the life of the base by many years. This is especially important where the soil contains a lot of clay. Geotextile provides an insurance policy against base failure. Q: Why is sand used? A: Concrete sand is used as a leveling agent and to provide “interlock” between pavers. Q: Is there a limit to how high a garden or retaining wall can be? A: Height limitations do apply to certain wall materials, however, with the use of appropriate materials, walls can be constructed as high as necessary. A: Sealers offer several advantages: they help resist stains, make some stains easy to remove, enhance the color, and bind the sand in the joints to make it difficult for weeds to germinate. Liquid sealers are applied after the pavers are installed and cleaned. Paver suppliers can recommend cleaners for concrete pavers. Once applied, the sealers soak into the concrete and into the joints. Sealers will not extend the life of pavers. Sealers should not be applied within the six months of paver installation. Q: Are there disadvantages to sealing? A: Since sealers are a transparent paint-like coating, they generally need to be reapplied every three to five years. Use sealers specifically for concrete pavers. More intense use of the pavers and extreme climates often increase the need for re-applying a coat of sealer. Q: Will weeds grow between my pavers? A: Weeds and grass result from seeds or spores blowing into and lodging in the joint sand. This can be minimized by sealing the pavers or by using polymer based joint sand. If weeds do appear, a spot vegetation killer (such as Round-Up by Ortho) can be used and will not damage the pavers. Q: What can I do if my pavers are stained or damaged? A: One of the advantages of pavers is that individual units can be removed and replaced in these situations if a permanent stain or damage occurs. Many suppliers of concrete pavers offer cleaners especially made for removing stains and for overall cleaning of the surface. Q: What can you tell me about snow removal and my pavers? A: Pavers can be plowed and shoveled the same as asphalt or concrete pavements. In fact, the chamfered edges and joints around the pavers promote melting of snow and ice. A plow with a rubber edge is recommended. Do not use sharp objects to chop ice as they can damage the pavers. Both sodium chloride (rock salt) and calcium chloride will remove snow and ice but can harm the pavers (and any concrete surface for that matter). Safe Thaw® ice melter is an effective and safe de-icer for your paving stone installation. Q: My pavers have a white haze on them. What is it and how do I remove it? A: The white haze is most likely efflorescence which occurs when the natural salts in the raw materials settle on the surface of the paver. This is common with all masonry products. Surface moisture acts as a wick to draw out these salts. The best course of action is to do nothing; natural weathering will remove the efflorescence generally within 6-12 months. Chemicals specifically designed to remove efflorescence are available. They will only remove the surface salts and cannot stop the process. Carefully follow the directions if you decide to use these products. They are caustic in nature and can damage the pavers if used improperly. Generally, efflorescence will continue for up to one year.